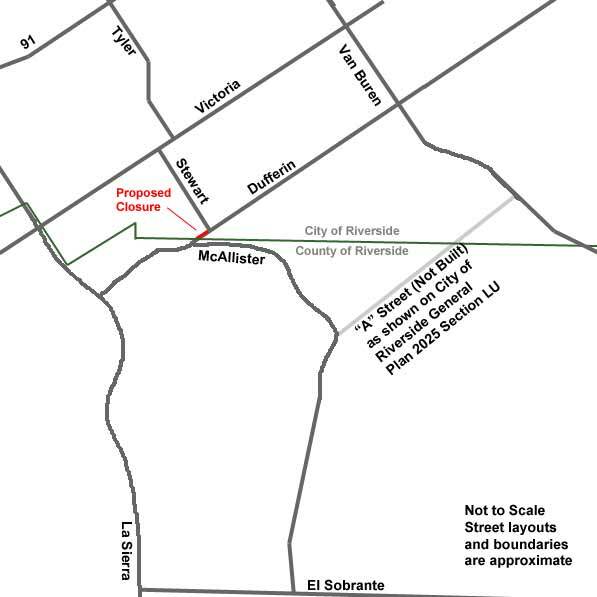 The City of Riverside intends to close Dufferin Avenue between McAllister Parkway and Stewart Street, eliminating the intersection at McAllister Parkway and Dufferin. For residents of nearby communities including Bridgeport, Stone Harbor, The Orchard and Victoria Grove, this action will cut off a vital route for shopping, work, school, etc. More importantly, it will also cut off the only alternate route for residents in this area to “get down the hill” and/or access the 91 in an emergency or if La Sierra is ever blocked. 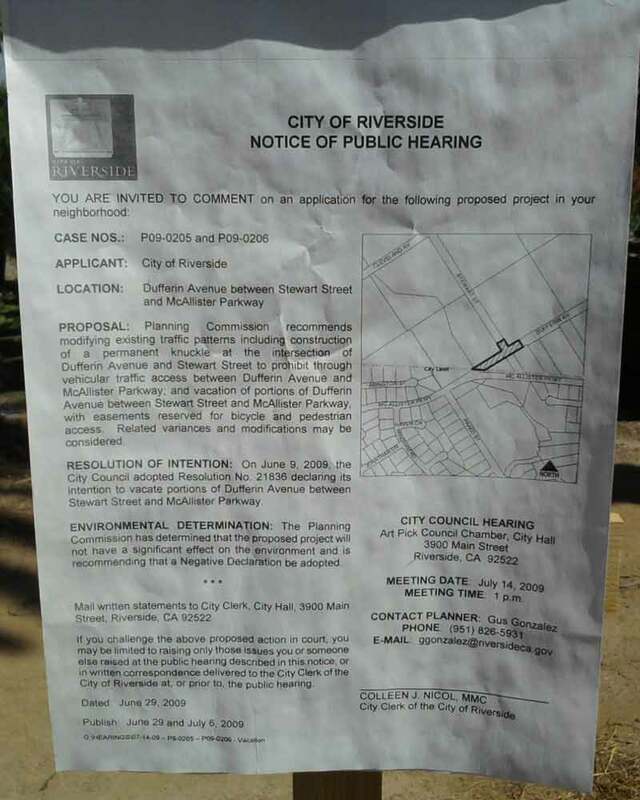 If this will affect you, the City of Riverside has set a hearing for July 14, 2009 at 1 p.m. (details below). I plan to be there. The County of Riverside sent a letter to the City dated April 23, 2009 (pages 27-31 through 27-33 of the Memo) raising some issues and requesting additional steps before moving forward. The County is supposed to build a street (referred to as “A” Street) from McAllister Parkway to Van Buren to provide much needed access to the residents that will be affected by this closure, but the street has not been constructed and, according to the letter, “is not apparently moving forward at this time”. I appreciate the letter written by the County, and hope that our County Supervisor, Bob Buster, actively gets involved to make sure that this vital access is not removed. If you would like to contact Bob Buster, click here to visit his website. Minimize neighborhood concerns. According to the Draft Planning Commission minutes from May 7, 2009 (pages 27-73 through 27-80), 20 out of 30 speakers spoke in opposition to the proposed closure. In addition, this closure directly benefits three properties on Dufferin within the City of Riverside, which will have driveway approaches installed at the “knuckle” so they will have continued access to Dufferin and Stewart (page 27-6). The rest of us will have no access. This closure will be for the benefit of a few but the detriment of many. Cut-through traffic. Only 39% (556 out of 1,415 trips) of all peak hour traffic entering Dufferin Avenue at Van Buren or McAllister Parkway is cut-through traffic according to a traffic study conducted on February 19, 2009 (pages 27-73 and 27-9). So, while this closure will take away a vital route from many residents, it will only reduce 39% of the traffic. Although the “39%” was incorrectly calculated as 51% when the traffic study was first reported, the City’s Associate Planner stated that the mathematical error does not affect the staff’s recommendation to proceed with the closure “as it continues to represent a significant amount of traffic cutting through the greenbelt”. I would bet that much of the “39%” will end up on Victoria, so I’m not really sure what this closure will accomplish. Also, this traffic study was conducted while the La Sierra / 91 interchange was being constructed (as pointed out in the County’s letter referenced above), so the 39% very well could be inflated. Speeding. At best, this may eliminate 39% of the speeders, but it won’t eliminate speeding. Public Safety. Which public? For many County residents who live in the area, this closure will take away the only alternate route to access Van Buren, Tyler, the 91, etc. in the case of an emergency and/or La Sierra closure. Removing access to an alternate and more direct route that will be crucial in an emergency does not seem to promote public safety. One of the speakers at the May 7, 2009 meeting stated that an ambulance used this route to take him to the hospital, and that if the ambulance had taken the longer route, “he would probably be dead”. The City will continue to work closely with residents of potential annexation areas to ensure that community character and feel can be preserved to the maximum extent. Unfortunately for us residents, it seems that being in the sphere of influence means the City of Riverside doesn’t want us to use its streets. Section 1: That the City Council of the City of Riverside hereby declares that in Planning Case No. P09-0205, its intention to modify the traffic pattern at the intersections of Dufferin Avenue and Stewart Street and Dufferin Avenue and McAllister Parkway, pursuant to Section 21101 of the California Vehicle Code and the Circulation and Community Mobility Element of the General Plan to provide for the construction of a permanent knuckle at the Dufferin Avenue and Stewart Street intersection, the removal of access at Dufferin Avenue and McAllister Street by the installation of a six-foot high fence at the southwesterly portion of Dufferin Avenue at McAllister Street. Section 7: The date, hour, and place for hearing all persons interested in the proposed traffic pattern modification measure at the intersections of Dufferin Avenue and Stewart Street and Dufferin Avenue and McAllister Parkway, and the vacation of Dufferin Avenue between Stewart Street and McAllister Parkway, is set as July 14, 2009, at 1:00 p.m. in the Art Pick Council Chambers of the Riverside City Council located adjacent to City Hall at 3900 Main Street, Riverside, California. I am a fan of the City of Riverside. We eat at restaurants in the City, shop in the City, go to church in the City, and send my daughter to school in the City. I even wrote a review of the recent AVP event and complimented the City on a great event. But in this case, I believe that the City is completely wrong and should consider the needs of all residents in its sphere of influence, not just those within the City. Note: Although the City has set the date for this meeting, please refer to the City’s website for any updates. I plan to post updates here as well under “dufferin closure“. I’m a resident of the Orchard and we have been actively working to garner support against the road closure. Please email councilmen, letters to editorPE, garner business support and turn out in force on the 14th. I believe the issue will be on the agenda in the evenning so residents can attend. Great site. 42 years I have live in Riverside. I have seen it grow like crazy. Stop signs, Traffic signals and now intersection cameras. All things that come with the safety for the increase of residents. Closure of a street to keep people from saving time and gas? That is not what the City Of Riverside has ever done and I hope doesn’t do. I spoke to a city councilmen who happens to live by Dufferin and Adams street. His comment is that with all the vehicles going through the orange groves we will be killing the trees from our emissions. We have more trees than many other citys and I haven’t seen one die because of this. Maybe he wants his peace and queit that many Riversiders had before we came more populated. Well my advice to him is move out of the IE because it keeps on growing and all of us some day will have to deal with traffic. When we lose 3 out of 5 Riv. Co. structure fire engines, our mutual aid engine from Riverside City and my wife dies from a heart attack because the ambulance has to take the long way around, I believe it will be time for a class action lawsuit from all of us in the county area that are affected. I wonder how Gloria Allred would feel about all the publicity we would generate if she were to be lead council. 1000 cars a day going the long way around, hum, lets see 1000 cars per day times 3 miles around and back to Tyler is 1,095,000 miles per year divided by 18 mpg is an extra 60,833 gallons of gas fumes going into their precious greenbelt every year–goes to prove that nothing was thought out except for the 3 whiners on Dufferin. What a joke, I live in Riverside, pay taxes to Riverside, lived in Canyou Crest for years, buy a new house off McAllister and now they plan to close the street. I travel dufferin everyday and never had one traffic jam, this is pure B.S., it sounds like one person that owns property on dufferin and has an influence on someone downtown, this person needs to be found and fired! Lets all suffer because someone does not want us on there street, well buy your own city, maybe that will change things, what a crab! Just my 2 cents….I realize that 3 selfish people want to minimize the traffic and emissions on their precious street but I have one simple question. Do they all drive electric/hybrid cars? Can a few people actually have such an influence on city council that they boldly adopted the plan before it was common knowledge for the vast amount of people afffected by this plan. Wait a minute…It is already moving forward! How many of you have seen the survey crew working out there before the hearing? This is a done deal in my opinion and amidst the economic conditions the city is facing how do they justify spending $80,000 on this project when the piece of property they stole on Victoria/ Van Buren via eminent domain remains vacant with no real signs of life anytime soon for the proposed park. The city is crooked and the counsel members are all from the good ole boy fraternity and act as they please because they govern themselves. Thank god Mr. Schiavone got ousted by somebody who might shake the council up a bit. Oh and did I forget the Overlook Parkway issue? Seems kinda funny how the road is built on both sides of the canyon but those with the strongest influence are keeping the project on the back burner while the million dollar estates owners constantly line the pockets of their representatives. Enough about my rant! The closure is dead wrong and it affects more than 3 members of the community but apparently it doesn’t matter to those who are the law in town. What will they do if they ever annex us poor old county folks? Pay another $100,000 to open it back up? Get real Riverside City Council and open your eyes and ears instead of your wallets to collect on a pathetic idea that will cost many people time and hard earned money. The kind of idea that could potentially convince residents to go to neighboring cities should they shop elsewhere because it’s a pain in the neck to drive down the next unsafe and congested street you already consider the holy grail of Riverside “Victoria Ave”! The last time this was slated as an issue, we(the residents most affected) were told that until there was a road that went thru to Van Buren this would not be an issue again. The sitting council is very sneaky and has repeatedly done their best to keep what they are trying to do very hush hush. The only time I have seen trees die along Dufferin is when it was intended for developement or a new grove or nursery. Something else that is counter intuitive to their belief of a dying greenbelt, all of the houses in all of the neighborhoods throughout Riverside, including but not limited to downtown, the magnolia center, our neighborhood, etc have lots of lush green yards with vibrant healthy trees and there is far more traffic in these areas as opposed to what these greddy inconsiderate and sneaky people are trying to protect. Oh, by the way, I have yet to have one nursery owner complain to me about the traffic on Dufferin, and I frequent many of them buying plants. Ultimately, what freightens me the most is the impact on safety for thousands of homes and people. The city cannot dispute the importance of ingress and egress to any neighborhood, nor can they dispute the negative impact this plan would infact have to the many they are trying to maneuver around in order to block Dufferin. I think if one these people were affected in such a way they would surely want to raise hell over it. The fire department on Indiana can much more easily reach our neighborhood via Tyler to Victoria to Stewart to Dufferin to Mccallister etc.. rather than go the long way to LaSierra and then up to our neighborhood. Statistics put out by the American Heart Assoc are very solemn when we look at the effect this closure will have on ingress and egress. If it is not bad enough that response times in an emergency situation will be slowed significantly, any victim still has to get clear across town to Riverside Community. I beg anyone reading this to get your facts in order and take a sick day to make this meeting, because our safety will be greatly compromised if this process does not get stopped. Where ther is Smoke there is Fire and I see alot of Smoke and we need to expose the Fire before we all get burned. Thanks for the comments everyone. The reason I wrote this post is to alert people about the probable closure and the hearing on July 14th since both the City and the County have done almost nothing to alert us County residents. All I’ve seen from the City are the public notices buried in the Press Enterprise in places that almost nobody would find them, and two small notices on Dufferin (in front of two of the properties that will benefit from this closure). When I called Bob Buster’s office (our supervisor), I was simply referred to the letter written by the County to the City. The more people that speak up, the better. Don’t wait until the meeting to act! The City Council may view us as unimportant but if we aren’t without power. We need a large group of people to contact the store managers of the stores at Tyler Mall and the surrounding area. We need to tell them that the city wants to hinder or shut off our access to them and that will mean a loss of revenue for their store. Ask them if that is what THEY want. Of course they will say NO. Then ask them to contact they City Council immediately and voice their protest. The coucil may not want to listen to us but if enough people ask them to I’d bet those store managers would speak in our behalf. I think that if they heard from the managers of Macys, Pennys, Nordstroms, Target, Borders, Olive Garden, The Cheesecake Factory etc all saying they don’t want this they would at least listen to them! Also I got a note tonight saying that the meeting was on the 19th. I don’t think that is right as that is a Sunday. When the new developments along La Sierra were being proposed, the developers had several meetings for those of us in the Orchard. At one meeting, large maps were displayed that showed the flooding that would happen if a large earthquake damaged the Lake Matthews dam beside El Sobrante. The maps showed that Lake Matthews would flood down La Sierra. If we couldn’t get out through Dufferin, and if La Sierra and El Sobrante were flooded, we would have no way out. Has any disaster official looked at this? It looks like some in the city have decided to let us all drown (if a big earthquake takes out the dam) in order to placate a few homeowners on Dufferin. How do we get disaster officials involved in helping us? Todays Press Enterprise had an article stating Cajalco will be widened to six lanes in many areas and the curves will be straightened. With the closure at Dufferin, and the revamping of Cajalco, it’s becoming even easier to shop Corona instead of Riverside. One thing that is being overlooked here is the impact on the High Occupancy Vehicle commuter. There is an entrance to the 91 Westbound HOV lane between The Tyler and La Sierra on ramps. The next HOV lan entrance does not occur until between Pierce an McKinley. This means that despite doing what we can for the envornment we will still be stuck in traffic spewing out far more exhaust because of this closure. I will not enter the 91 at La Sierra. In addition LA Sierra does not have an adequate bicycle lane between Cajalco and Victoria. Dufferen may not have had an adequate bike lane, but it had less traffic and was safer for bicyclists. My wife and I purchase most of our household needs at the Target on Tyler. We dine often at the resaraunts on Tyler If this closure takes place we will start using the amenities in Corona because it will be an easy commute. Lastly, I never use La Sierra. There is a large collection of pick-up trucks and work trucks (plumbing and/or construction) that come out of the Lake Hills area. The drivers of many of these vehicles are selfish and unsafe drivers that make driving on La Sierra a hazard. As I said in another comment section…the people asking for this closure are pure elitists who think that they are entitled to special treatment. I am a single mom who worked for years to be able to afford a home in a nice community such as Victoria Grove. I work in Corona so I carefully chose this location to settle in due to its’ centricity to both Riverside and Corona. By closing down Dufferin this will be sending my family primarily in the direction of Corona for shopping and other excursions. In these tough economic times I don’t think this closure would benefit the merchants and restauranteurs of Riverside. This action could also reduce the property value and desiribility of the Orchard and Victoria Grove due to our “outcast” status. Prior to my move to Victoria Grove in 2007, I met Councilman Chris MacArthur as he canvassed my old neighorhood for votes. We had a nice talk on my front porch and he seemed like he genuinely cared about voter input. Based on his reasoning and alarmist attitude in regards to this situation, I have come to realize he is just another politician using his political pull to further his own personal agenda. As for the 1:00 time slot for this hearing…wow…could the Riverside City Council be anymore oppositional? When Eliza Tibbetts imported the first orange tree to Riverside I don’t think she had self-righteousness in mind as does the Riverside City Council. 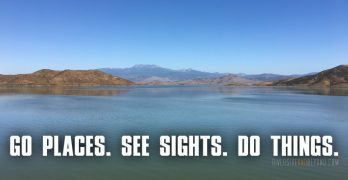 Trash, Water,Phone,Electric,Schools,Work,Mail,UPS, ETC: WOULD ALL USE LA SIERRA because someone is using power to make City of Riverside look corrupt. Most of Dufferin and Stewert is BUSINESS they took out orange groves and put in Nursreys THAT ARE BUSINESS and they are putting in more. The so called GREEN BELT area has been extinct for years. They put in to many houses and took out what started as GREEN BELT area and now it is all traffic: The difference is someone doesn’t want us to use Dufferin for there own personal reasons not because it benifits RIVERSIDE it doesn’t it takes away from them. We all will put more miles on Schools Buses for kids to have to leave earlier and come home later. My wife and I live in a Orchard View home. We are 100% against the closure and we will attend the July 14th meeting. We estimate that we use that road 50-60% of the time, if not more. I am a Bridgeport Owner. My feeling on this is that someone who works somewhere for the City of Riverside some influence on this closure. Find the person or relationship to the City employee and publicly exploit it and we increase our chances of stopping this. For me, if they do close this, I will only change my route to Van Buren by using Victoria but only to Stewart. I will come back up Stewart to Dufferin. I will use this route even if I don’t have to. Just to put more traffic on Dufferin. If this does close we should all make it our mission to generate even more traffic on Dufferin even if we don’t have to. It’s a few cents more in gas and time but the statement we would make if EVERYONE did this would be HUGE. As a 10 year resident of the Orchard, I am very disappointed to hear of the plan to close Dufferin. It is clear that this decision will have many negative ramifications on the merchants in the Tyler St area as it will become more efficient to shop in the Corona area! I see this as a very sad day for the local community and sincerely hope that the Riverside City Council will consider the needs of the residents before proceeding with this action. When I used to take my kids to Arlington High School from Victoria Grove we were often running late because of the back log of trafficin the area. Dufferin Street was a helpful shortcut because it made getting to Van Buren a little easier. With that said, it still took over 20 minutes on some mornings to get to the school. Without Dufferin, that commute could be up to 30-35 minutes long on occasion. Is that acceptable? Should it take that long to get your kids to a school that is in their community? Also, if Dufferin closes I will no longer shop at Albertsons or go to any of the restaurants in that plaza. It will be easier to shop at Ralphs. I will not go as often to the stores on Tyler either. I suppose the stores in Corona will get more of my business. Additionally, has anyone taken into consideration what could happen if an accident occurred on La Sierra which made the road impassabe for any length of time? That could be dangerous if emergency vehicles need to enter the communities at the top of the hill. Please do not put the rights of trees above those of human beings. Moreover, my escrow papers informed me that if the dam ever failed, there could be flooding of La Sierra. That would essentially trap many residents. Politicians need to think of what is best for the majority, not the few. Remember annexation!! Who will vote for it if we get cut off?? The last time that this road was closed by the city they told us that it was “an accident” and reopended the road after a huge outcry from the residents. Some children were stuck on school buses for 1.5 hours longer than normal and moms and dads were frantic trying to figure out what was going on. A fatality accident happened at the closure. The city promised that the road would not be closed util the A road cutoff to Van Buren was completed and it has not been completed. The greenbelt is dead. Traffic can’t kill it any more that the poor planing and uncontrolled growth that the city and county have both done. Cyclists will be cut off from a traditional road across Riverside and minorities – landscaping laborers will be impacted. There will be extra fuel used by school buses, car and commercial landscaping trucks that cross these roads. The La Sierra freeway intersections has made us prisoners in our homes for the last several years. Now that is finally completed and they plan to imprison us again. It was ludicrous to close off the original McAllister. It was a straight shot past Dufferin to Victoria and to all the shopping and schools. We moved to the Orchard 12 years ago. We were told the orange groves east of McAllister and west of McAllister to LaSierra were protected. All the orange trees are now gone, replaced by homes and dirt. Our schools are off Van Buren. If the closure takes place, it would be 5 miles further round trip, twice a day for us (and how many others)? Albertsons Market and the rest of that center will probably lose 500 to 1000 customers. Once you are on La Sierra, it only makes sense to shop Ralphs or Staters, rather than drive the extra miles to Albertsons. If the closure takes place, we will make a point of making our twice a day trip to school via LaSierra/Victoria/Stewart/Dufferin. The Tyler mall and restaurants will lose our business to Corona shopping. Do I sound angry? I am!! Will Buster get our votes next time around, NO! I use Dufferin for many reasons and I am very concerned that this “possible” road closure is very wrong. When using this road, East to Van Buren I have noticed many new Landscape Nurserys and I recall that a lot of orange groves died because the owners could not afford to water the orange trees. I was also advised that there would be a road going through to Van Buren for all residents of the mentiond areas. I think the City should spend a little more money on giving us the new road and spend less of their funds on trying to close Dufferin at the McCallister turn-off. As a resident of the Orchard, I have been fighting against this closure since I was first made aware of it nearly three years ago. Much has been promised, and — good to their word — the city did “reopen” the “accidental” closure rapidly the last time it occured. Nonetheless, after speaking with numerous people at both the City and County regarding this issue, it is clear that all of the required public hearings are being made as difficult to attend as possible. Additionally, the tenor of the previous (June 9th) meeting made it clear that the City was uninterested in our concerns and had every intention of approving this modification regardless of the onslaught of valid points (many relating directly to safety) raised by the overwhelmingly-negative response of myself and my fellow neighboors. Despite the apparent futility of or position, however, I think it is vital for us to bring a strong and unified opposition to this plan (and, hopefully, representatives of the Press Enterprise and/or other media outlets) with us to the meeting tomorrow. This is a monumental change that will negatively impact the lives of hundreds of people for the benefit of a handful of residents and three properties, done under the guise of “traffic mitigation in the green belt mandated by voter initiative.” This argument is patently illogical. * The City appears unswayed by issues of public safety, as they consider our fire department and evacuation requirements to be met even after the closure of Dufferin, despite common sense and research to the contrary. Nonetheless, these issues should be raised repeatedly, hopefully with evidence to support them (I am trying to collect whatever support I can). * Residents of the roughly three effected properties will likely be present and will likely speak, including multiple individuals from each single property to imply broader support for the proposal. They will likely city issues of “dangerous drivers” and “near accidents” at or near their properties. These are problems that we all face, and while I sympathise with their concerns, this proposed solution is neither equitable nor appropriate. Nonetheless, prepare for knowing nods from the council and softball questions to these residents, designed to inflate apparent public support for the closure. Just some thoughts as we prepare for an important meeting tomorrow. See you all there. I personally have lived in Riverside…(The Orchard to be exact) since I was 6 years old. I am now 31 and my husband, daughter and I just bought a home in Victoria Grove in 2008. I have been traveling through the Dufferin area for YEARS NOW. I couldn’t possibly begin to tell you what an inconvenience this would be to everyone that lives in this whole area, not to mention it’s our direct access to school, work, freeway access, childcare, entertainment, shopping, healthcare, etc….and most of all the only other way out besides La Sierra. What moron could possibly think that this would be a great idea. Seriously…. we would have never bought our house in this area if this was the case. We bought a house here knowing that this area is safe for our daughter including the school district and convenient for us in all aspects of our life. We will definitely be taking ourselves to Corona for all of or shopping, gas, food, EVERYTHING…. and we are not opposed to moving as well. As for dangerous drivers on Dufferin/McAllister…. It’s not like we don’t have them on the freeway, on city streets, and in our own neighborhood. I’m sure the person who made that a point gets up and drives to work making sure they abide every law on the way, and driving the speed limit on the freeway when they are late to work, or taking their kid to school. Like I sai;, I have been living in this area for 25 years….way before any of those affected properties were in this area, before there was one stop sign on Dufferin, before Mc Allister Pky existed….this is absolutely ridiculous for all of us. In a few minutes my wife and I will be headed to the council chambers to voice our opposition to the closure of Dufferin. This is a vital road for hundreds of homes south of McAllister/Dufferin and its closure will eliminate many trips to Riverside for shopping. The city should improve this road, not close it. The City of Riverside will be the loser if it’s closed. So it seems that council was going to close the road after all NO MATTER IF THERE WAS A HEARING OR NOT… This decision was prejudged before this meeting had taken place. Wow, the power of government in taking what they want, when they want. 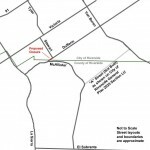 For all the residents that are now officially segregated from the CITY, I encourage you to still use the other side of Dufferin when coming from Van Buren and make that right to Stewart on to Victoria so that we can parade everyday to the residence in favor of closure that this was a bad mistake they had wished for. Never cease to use their beloved streets as they are yours as well. Keep proving to them that nothing will be changed till these streets are no longer of use to them. If Dufferin shall be closed, it should have been closed at Van Buren as well to prevent all access – even to the city residences. I sure hate it when someone or group wastes my time. And it appears that is exactly what the Riv City Council did today. It seems obvious that the decision had already been made, since the barriers went up immediately. Have they ever been that efficient or acted that fast at anything else? When heading east I will now use Victoria to Stewart to Dufferin, and will drive the speed limit or just under it. And I will try to use Corona businesses more often now. I AM VERY DISAPPOINTED AND WILL VOTE ACCORDINGLY. The closure of Dufferin is the most incredibly stupid thing I have ever had the misfortune to experience. I live Stone Harbor and travel down Dufferin daily. It is amazing that our city is so stupid that they closed a street for no reason other than to frustrate residents! I am disgusted. As if I needed another reason to leave Riverside! Do you want to look like a total stupid a–? After attending yesterdays hearing on the Dufferin closure that’s how I feel. A packed council room sat there for almost 4 hours while the council members laughed up their sleeves at what a bunch of idiots were sitting out there. After 4 hours listening to both pros and cons imagine my surprise when I went to go home on Dufferin and I found the street already blocked off. Have council tell us a decision has been made and to go home, this I understand. But, to make fools of us for 4 hours when the closure was already ordered in the morning is typical politics. I don’t know who paid the council off, but it was done well and it worked, typical good old boy syndrome–don’t tell the truth at any cost. No matter what the result, true advocates representing the city would have had the decency to not sit there and lie to us for 4 hours. I do know that if it says incumbent under the name in the next election, I’ll vote for someone else. Maybe if we voted this way all the way up to the presidency of this country, we might not be in hock up to our ears, other countries might decide we are not as bad as they think we are, jobs might be saved and foreclosures might stop or at least slow down. Remember folks, honesty to the people starts at the municipal level and goes all the way to the top. Or, we can vote for the same state good old boys and girls and the same congressional bunch and stay right where we are. Lets vote for honesty for a change and dump the good old boy syndrome on its’ ear. And like it or not, that’s what the Riverside City council consists of from what I see from my side of the fence. Wednesday in the PM. Just found out the HOV lane on the 91 starts after La Sierra so had to cut lanes to get off on La Sierra just to find out the signals were out and everyone had stop signs. The stop signs were just what the Riverside city council was told would happen by those foolish enough to be at the council meeting yesterday. My bad on not knowing where to get out of the HOV lanes. But, what the heck council says I could take the 15 south and come in from the other direction and dump another couple of gallons of pollution in the air—much better than driving thru their precious greenbelt of nurseries or disturbing their precious campaign contributors. Only lived out here a couple of months, I’ll get it right soon enough. so we all know that dufferin has now been closed thanks to some people that do not want us to use it. we need to fight back by have protests and or silly pranks. we all know who these people are because the road closes in front of their property, so when ever u pass down mcallister or duffrin, HONK like crazy! this will drive these people crazy. This public hearing was utter garbage. I have used Dufferin to go to elementary school from the Orchard years ago and still use it now to get to UCR and everywhere else in the city. Two giant blocks of citrus trees were just recently cut down in the past few months so I have absolutely no idea what greenbelt they are trying to preserve when the only green left is from the nurseries growing palm trees and basil. The traffic on Victoria is so mind numbingly slow that it makes more sense to circumvent the closure and continue using Dufferin even though the half past Van Buren is riddled with bumps thanks to the installation of some 7mile long pipe to redirect rats and raccoons. Considering that Dufferin was closed DURING the public hearing, I find that the city went about this in quite the communist fashion. Signal left and turn right. Drove up McAllister today and noticed the new “Dufferin Closed” signs. It’s very upsetting that the City of Riverside would hold NO regard for the 1000’s of people in this area. What a shame, Dufferin was not only a quicker way to Riverside, but a beautiful drive. I also notice that the morons did not remove the stop signs on McAllister. Who puts a stop sign on a through street? Talk about wasting fuel. I won’t be driving Dufferin anymore to and from work however, I will be taking drives through the beautiful Dufferin groves on the weekends. During this time I will not be driving my low emission car, I will be cruising in my 1965 classic, much less emission friendly car. (I will discontinue this if I see the trees start to die! I too am a nature lover). What else can we do? New resident to Bridgeport but a 20 year resident of Riverside. Love the drive in the mornings thru the groves a reminder of what Riv is all about, the people. Its sad that will all the homes in that area we cannot have access to the other side (Van Bruen) which is the way I travel to work…I will miss it and the groves. We’ve been taken to the cleaners by the politicians. As County residents we can’t vote against the City officials, but we can against the County people like Bob Buster. I attended the 07/14/09 hearing and spoke, opposing the closure as a public safety issue. I’m disappointed in the Dufferin Ave. closure, but angry that to my knowledge (arriving around 1:15PM) the County did not even send a representative, and the City and County would not cooperate to postpone the closure until they had an alternative such as Ave A actually operational. The County allowed all the homes to be to be built south of Mc Allister Pkwy, east of La Sierra all the way south to El Sobrante, yet they appear to have abandoned their constituents after they bought their houses, and the officials appear to have no concern for public safety issues. I’m furious at the deceit and contempt of the City pretending to hold a hearing when they appear to have had the work crew standing by, and actually at the site within 40 minutes. Interesting that as of 07/16/09 AM, they have not taken out the stop sign at Dufferin and McAllister Parkway, because there is no longer any cross traffic to stop. They could have done this quicker than barricading Dufferin. I think this great website needs to now help turn our attention to the County responsibility to its constituents.